April is National Credit Union Youth Month, making it a great time to help your children get started down a smart financial path. 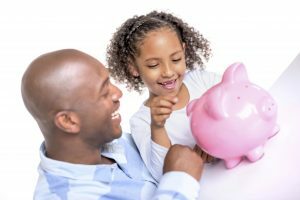 Here are some steps that you can take to teach your child, no matter their age, the significance of making sound financial decisions. Some parents see chores as something that their child should be doing as a member of the family and they shouldn’t be paid for pitching in around the house. However, there is a compromise you can make to help them differentiate between basic responsibilities and earning money. Have a list of optional jobs that go above and beyond their usual chores and assign each a dollar amount. If your child needs money for something, have them pick some extra jobs to complete and reward them for their additional work. During the month of April, bring your child aged 12 and under into any of our branches and we will open and deposit $5 into a Dollar Dog Savings account for them. Make it a habit that whenever they earn or receive money, they put a portion of that into their account to help encourage and teach them the importance of saving. When your child does save up to buy something, have them pay in cash, if possible, so they are able to watch the transaction first hand. 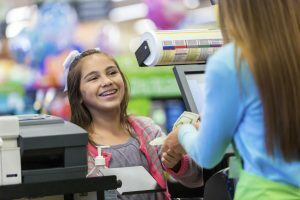 By actually handing the money to the cashier and receiving their new item, they can see that the money they worked hard to earn is gone. A physical representation of spending is better than your child giving you the money and then you using a credit or debit card to make the purchase. Instilling a sense of giving into your children when they are young can help them become more compassionate and charitable people as adults. There are several, easy ways to do this; for example, before holidays and birthdays, have your kids collect old toys or clothes they don’t use anymore or have outgrown and donate them to a local charity organization. Explain how they will go to children who need them and how important it is to help those in need.